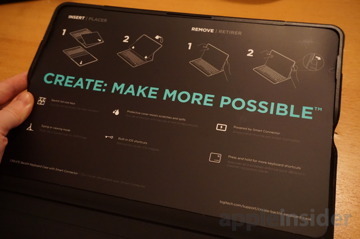 Just hours after Apple opened the iPad Pro preorder floodgates, Logitech unveiled its first accessories for the jumbo-sized tablet, including the Create Backlit Keyboard Case, a folio-style protector with full-size keyboard, Smart Connector support and more. 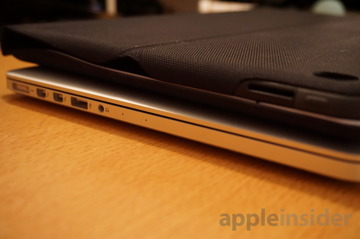 AppleInsider goes hands-on. 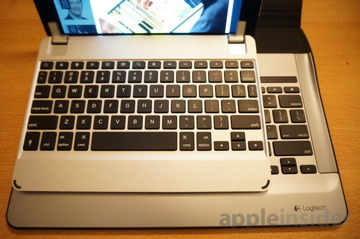 Logitech says the Logi Create Backlit Keyboard, not to be confused with the Logi Create Protective Case, was designed in close collaboration with Apple to match not only iPad Pro's aesthetic, but its promise as an on-the-go productivity tool. Instead of going with a standard rubberized exterior, Logitech chose a rugged tightly-woven fabric to wrap Create's keyboard and paired iPad Pro. 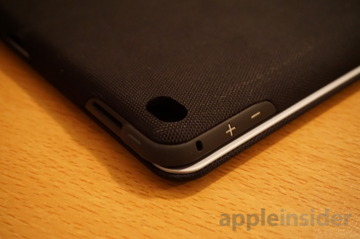 The material feels durable and we don't doubt on-the-box claims of resistance against scratches and scuffs. 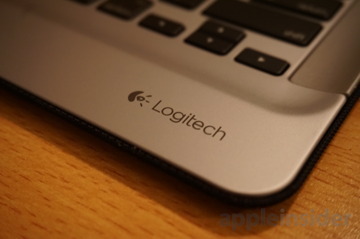 Logitech also says its special fabric protects against spills. 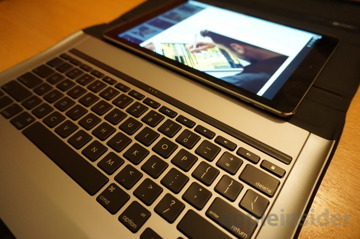 As for docking, iPad Pro snaps into a backing opposite Create's keyboard. 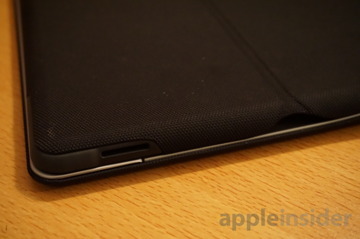 Flexing the bottom portion out allows the iPad Pro's smart connector to connect magnetically to the top of the keyboard via Apple's all new Smart Connector, a three-pin port that supplies Create power for its backlit keys and provides a hardwired data connection in lieu of Bluetooth. The keyboard itself looks more akin to MacBook Pro, with familiar black chiclet keys sitting in a shallow concavity, their tops flush with a raised palm rest. 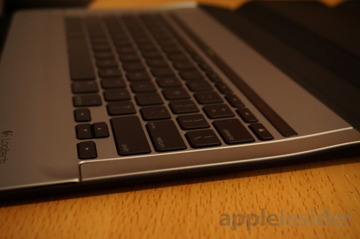 Thanks to iPad Pro's gigantic footprint —roughly the size of a 13-inch Retina MacBook Pro —key width and pitch are standard for a full-size keyboard with room to spare on all sides. 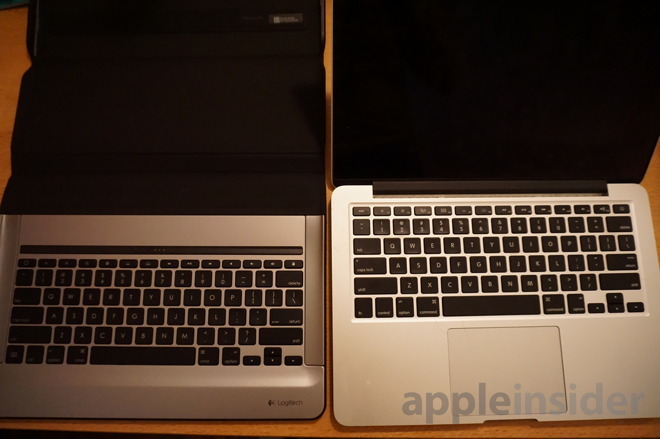 Logitech Create (left) next to Apple's 13-inch Retina MacBook Pro. Like other third-party keyboards, Create comes with dedicated shortcut keys and hardware controls for "typing or viewing modes," adding flexibility to iOS 9's onscreen shortcut bar. 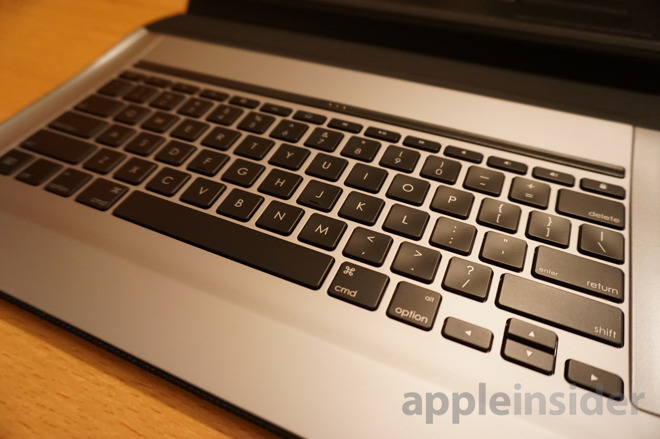 The keys themselves are on par with other third-party manufacturers in terms of travel and a fairly thick keyboard base makes the entire platform relatively sturdy for laptop typing. 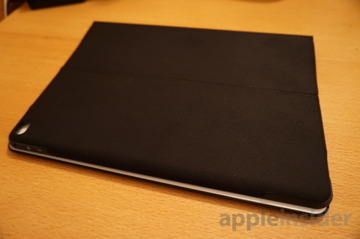 We're not sure how well Create will handle Apple's monstrous iPad Pro, which weighs in at 1.57 pounds (1.59 pounds for the Wi-Fi + Cellular model), but we plan to conduct a full test in the coming days. 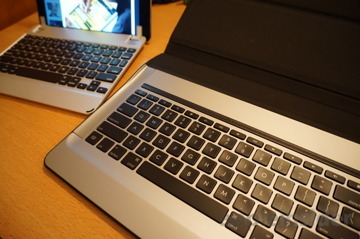 The Logi CREATE Backlit Keyboard Case is available from Logitech's website for $149.99.